Windows 10 hard drive ghost can be as easy as a pie as long as you find the best software - AOMEI Backupper. Read this article to find out how it performs on earth. Have you ever thought of the question: "why need I ghost my Windows 10 hard drive?" Maybe you only pay attention to protect your Windows 10 operating system – not enough. In fact, not only Windows 10 needs backup, the whole hard drive also needs to create a backup. Why? You know, accidents may happen at any time. Sometimes Windows 10 may suffer from virus and hacker attack; and sometimes you may make wrong operations; what’s more, the hardware and software may fail to give response. The most effective way to avoid data loss caused by these factors should be to ghost your Windows 10 hard drive before accidents arrive. How to ghost hard drive in Windows 10? Now let’s cut to the chase. Since you are going to ghost your Windows 10 hard drive, how to achieve this purpose? Luckily, the market offers various tools to deal with kinds of backup needs. Among these tools, AOMEI Backupper is the best one. AOMEI Backupper is the umbrella name of four editions: Standard, Professional, Server, and Technician. All of them provide the basic functions related to backup, restore and clone. Each latter one is senior than the former. Compared with the standard edition, Professional edition provides extra functions of Command Line Backup, Backup Disk Space Management, and Merge Images. Thus you can better manage your hard drive. AOMEI Backupper Professional supports all Windows PC operating system, including the new released Windows 10. Make sure your Windows 10 already contains a second hard drive that is going to be used as the destination path. If not, insert one. Launch AOMEI Backupper Professional, open Backup tab and choose Disk Backup. There are two steps for you to complete. Both are very easy. 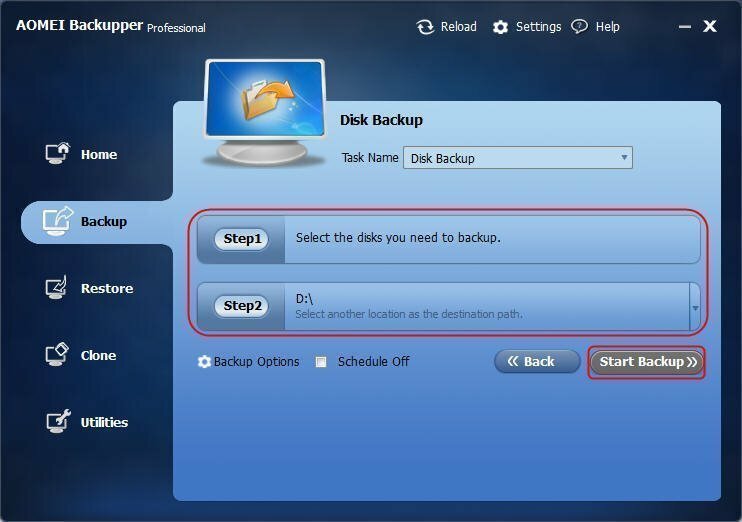 In step 1 you should select the disk you want to backup, and in step 2 you need to select the destination path, e.g. external hard drive, NAS/network, or CD/DVD. Now you can click the Start Backup button. Tips: If you want to backup the new-added data at times, you can schedule an automatic backup plan under Schedule Off button. 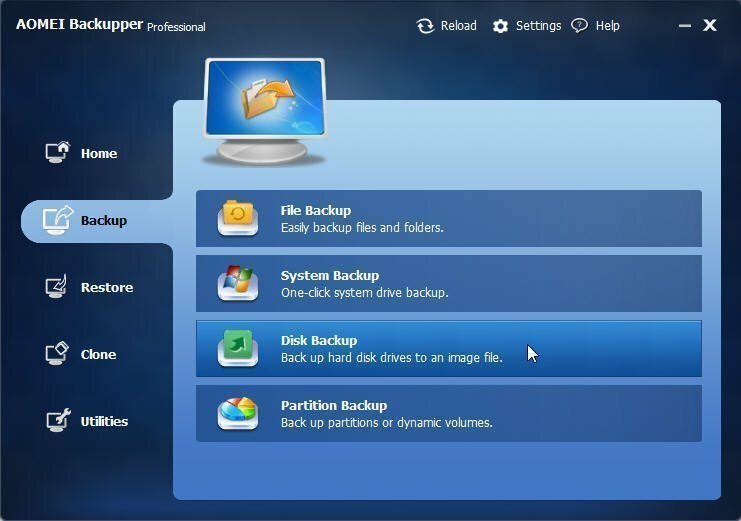 AOMEI Backupper has set incremental backup as the default backup type, since it is the most space-saving method. But if you want other backup types, you can change the setting under Advanced Settings. Now FREE Download AOMEI Backupper Professional for 30-day trial.